I bought Keen Sun Valley Slipper in September and I really like them. Today I got my Keen Sayulita Lace. These are, just like the slipper, “barefoot” in style with almost no heal and a fairly flexible sole. The shoes are wide and really comfortable. 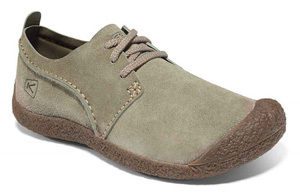 Perfect for your transition from work to play, week to weekend, Keen’s Sayulita lace-up shoes are made of soft, flexible suede and styled with a laid-back look. Posted on June 30, 2011 by BengtPosted in Bits and piecesTagged barefoot. Previous Previous post: How does one become a butterfly?